Our store is teeming with a pleasing selection of antique furniture in rustic vintage styles or in more modern fashions. You can discover any type of furniture including dinette sets, chests, bedroom suites, end tables, and so much more! Add a vintage effect with our lovely home decor pieces! We offer such touches as warm scented candles, dishes, unique boxes, mirrors, lamps, fixtures and so much more! 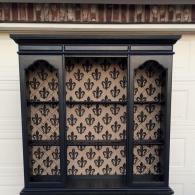 As part of our services, we also repaint and customize many of our furniture pieces and decor. We also distress a great deal of our furniture pieces to give it that worn, antique feel. If you have your own DIY project we would be happy to guide you or bring it to us and we will do it all! 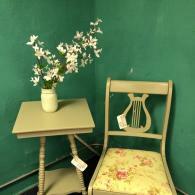 At The Weathered Pearl, we proudly sell a variety of beautiful furniture and home decor that you are sure to love! No matter what you are looking for, we are sure to have just that in our inventory of unique finds. From striking dining tables, to unique bedroom suits, our options are endless! 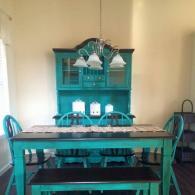 Not to mention, if you have something particular in mind, owner Stacey Murphy can custom paint it for you! You truly get the best of both worlds when you shop with us! 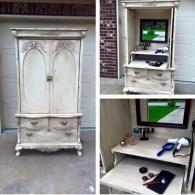 Take a look at photos of lovely antique furniture and home decor offered at The Weathered Pearl!